In this groundbreaking, definitive guide to the art of negotiation, PON faculty James Sebenius (Harvard Business School) and Robert Mnookin (Harvard Law School), along with R. Nicholas Burns of the Harvard Kennedy School, offer a comprehensive examination of one of the most successful dealmakers of all time: Henry Kissinger. Politicians, world leaders, and business executives around the world—including every President from John F. Kennedy to Donald J. Trump—have sought the counsel of Henry Kissinger, a brilliant diplomat and historian whose unprecedented achievements as a negotiator have been universally acknowledged. Now, for the first time, Kissinger the Negotiator provides a clear analysis of Kissinger’s overall approach to making deals and resolving conflicts—expertise that holds powerful and enduring lessons. Sebenius, Burns, and Mnookin crystallize the key elements of Kissinger’s approach, based on in-depth interviews with the former secretary of state himself about some of his most difficult negotiations, an extensive study of his record, and many independent sources. Taut and instructive, Kissinger the Negotiator mines the long and fruitful career of this elder statesman and shows how his strategies apply not only to contemporary diplomatic challenges but also to other realms of negotiation, including business, public policy, and law. Essential reading for current and future leaders, Kissinger the Negotiator is an invaluable guide to reaching agreements in challenging situations. 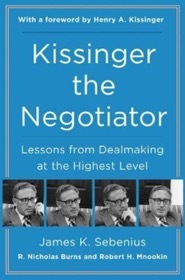 Order Kissinger the Negotiator Today! A west way to understand the international relationship in this polítical new age, and prospective of solutions.